This entry was posted on August 2, 2012 at 1:49 pm and is filed under Languages, Reviews. You can follow any responses to this entry through the RSS 2.0 feed. You can leave a response, or trackback from your own site. Hello! I just came across this entry while searching for Sanskrit lessons in Liverpool. Could you let me know where this was held? But I have some details of the tutor which I’ll email to you separately. It is virtually unfathomable that any teacher would use Coulson’s book as an intro book for the study of Sanskrit (unless, of course, he, for some reason, wanted to punish his students, or something . . . ). Coulson’s book might be all right for those who have struggled with their Latin and Greek a few years first; but other than that it is very intimidating. And even if one has studied Latin and Greek, one may still not know all the linguistic terminology that Coulson uses. I also can relate to the comment on the non-existing large, reassuring tables of paradigms: they are, indeed, small, ugly, and uninspiring. It is almost as if they were deliberately arranged in a non-tabular form so as to be more uninspiring, and give a less than favorable impression of the logic behind traditional Sanskrit grammar. The best suggestion is probably Maurer’s volume, with its myriad of interesting comments for every reading. I think that’s excellent value for the money. But the book, of course, is much too thick to actually be “practical” (it’s almost 1000 pages), and the chapter vocabularies are ridiculously long (sometimes over 100 new words per chapter). The running text of the lessons are also set with a too small font, and with an ugly fluctuating line height (it’s a modern Routledge production). However the readings themselves are actually, surprisingly nicely typeset in Devanagari. So one might think of this volume simply as a nice reader with nice comments on the readings, and everything else, such as the “instructing” text in the lessons, as a bonus (including the very detailed index by G. Fields!). As far as intro texts for Sanskrit goes, there is only one book that is really pedagogical and nicely designed and typeset, and that is Thomas Egenes’s two-volume set “An Introduction to Sanskrit”. I have seen many Sanskrit textbooks, and this is the only one that I can whole-heartedly recommend. It is the least intimidating book of all, and comes with straightforward exercises and answers, and fantastic tables. Unlike the Coulson volume, which also comes with exercises and answers and tables, the answers in the Egenes volumes are very carefully crafted, and not designed to be “tricky” or unsolvable; and the many, nicely designed tables in Egenes are a great help (some in Part One, but most of them are only in the appendix of Part Two). Gosh, this is by far the most interesting and useful comment anyone has ever put on here, so many thanks for that! Since I know an unhealthy amount about Ancient Greek and Proto-Indo-European, I can’t say that the punitive-grammatical aspect of Coulson worried me, though the presentation of the paradigm tables did. I think there may have been some mention of Egenes as guilty of spoon-feeding. Reasons for using Couson were that he had been a friend of our instructor’s and that the book was used for Prelims (that is, the introductory course) in Oxford: http://www.orinst.ox.ac.uk/isa/ba_sanskrit.html. In fact they also use it in Leiden: https://studiegids.leidenuniv.nl/courses/show/28617/sanskrit_1 while SOAS go for Maurer: http://doc.lang.soas.ac.uk/materials/lwt.htm. Jan Gonda, A Concise Elementary Grammar of the Sanskrit Language. With Exercises, Reading Selections, and a Glossary by Jan Gonda. Translated from the German by Gordon B. Ford, Jr. Leiden: Brill, 1966. [used with Coulson in Leiden] ? Thanks again for such an interesting comment! Thank you for your kind comments. I’d be glad to give some comments on the Deshpande and Gonda volumes. But first I’d like to say something about your own comments, which were very interesting. One also, I think, has to understand the selection of textbooks from a western “heritage” viewpoint, in a politico-educational scenario. I think it is clear, from reading a little about the British in India, that their aim with their Sanskrit studies was not *just* about some “mastering of a language”, but also about a “mastering of a heritage”, including its culture and religion (i.e., the “Christianity is the only true religion” idea). When the Sanskrit chairs at Oxford were to be selected in the 19th century, it wasn’t necessarily the one who was most knowledgeable who got the chair, but the one who showed most support for Christian evangelization (and, I would add, the one who was most “Western”-minded, or even “British”-minded); so Monier-Williams got it, not Max Muller (who originally was from Germany). I also liked your comments on which textbooks are used in different places. And I am actually relieved to hear that SOAS now are using Maurer AND Deshpande (see below)!! 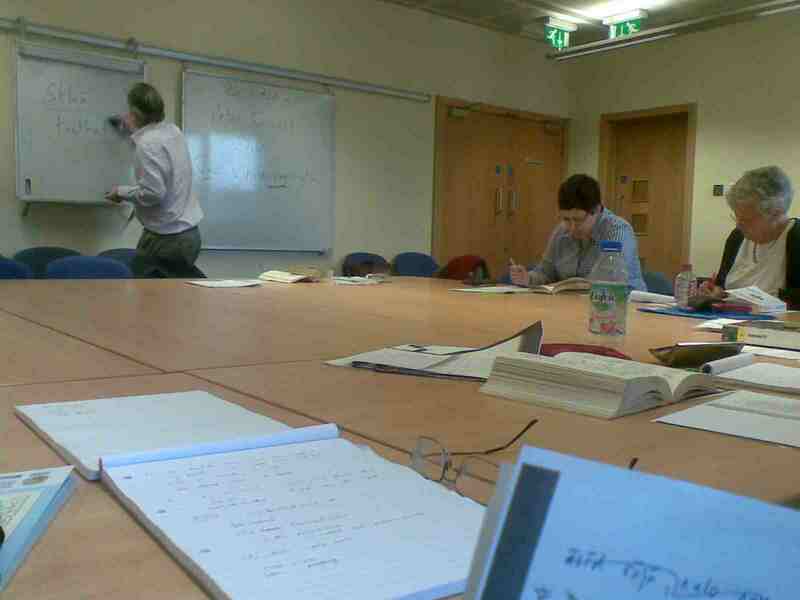 Many years ago (in the 1990s) I studied at the University of London myself, and thought about doing Sanskrit simultaneously with my other degree. So I went to SOAS and talked to one professor and one female instructor, and ended up even buying their Sanskrit “textbook”. But when I went through the book (a SOAS production, a translation of Stenzler’s old grammar from the German), I gave up all plans of doing Sanskrit in London. That book was no textbook; it was just a complicated collection of rules and paradigms, and LONG selections of Devanagari texts (printed nicely, though! ), which intimidated me so much that I just gave the whole project up, before formally registerring. Now to the Deshpande volume. I didn’t tell you earlier (sorry!) but I already have done “real” reviews of both the Coulson and Maurer volumes at my WordPress site (all book reviews are here: http://sanskritstudio.wordpress.com/book-reviews/), and I have also done one on the Deshpande. But even so, I’ll summarize it here for you, just in case you don’t have time to go there: it is a 6×9 inch production, 500 pages or so (similar in size and weight to Goldman and Goldman’s volume). Its main virtue is Deshpande’s short, concise, explanatory text (not like the talkative Maurer) that is very unpretentious and straightforward. Another virtue is its very numerous and very well-thought-out examples, which are a delight to see. It is also very nicely typeset in a large-enough, black-enough Devanagari, which balances well in size with the Roman typeface used. Its main “fault” is that there is no index (disaster! ), and no appendixes. But if the Sanskrit students at SOAS have Gregory P. Field’s super-index in Maurer’s textbook, then that is something, at least. As for the Gonda volume, I have not done an “offical” review yet, but I will. Until then, here’s my “preliminary” view. It is a thin volume (152 pp. ), even thinner than Macdonell’s portable grammar “A Sanskrit Grammar for Students” (which is 264. pp). But Gonda’s grammar is actually even thinner than that, in terms of actual *grammar* content. For instead of inserting grammar-related appendixes as Macdonell does, Gonda inserts “[Reading] Exercises” and “Reading Selections” (pp. 96-128) and an all-covering “Glossary” to the those readings (pp. 129-152). So more than a third of the already thin volume consists of reading exercises (in transliteration, not Devanagari!). And what’s worse, this seemingly results in the disastrous decision to not include any indexes. So while Macdonnel’s useful grammar has very nice indexes (one general index and a very comprehensive Sanskrit word index), Gonda has no index at all. Another main difference between Gonda and Macdonell is that Gonda does not use Devanagari thoughout the book (only on the first half-dozen pages, where he introduces the script), while Macdonell has Devanagari and transliteration almost everywhere. And I also don’t like the conjugation/declension tables, which are not always easy to read (some are designed in a “non-strict-matrix” way, where those entries that are shared between, say, masc. and fem. are printed not in the masc. or fem. cols, but in *another* col, centered in between the masc. and fem. cols). As for the “good” in Gonda, I would say that he is concise. And the “Some Remarks on Syntax” chapter has some valuable points, including examples. Also, the whole “readings” part is actually not bad, because it has many footnotes (but the notes as not nearly as extensive or numerous as those in Maurer). All in all, a good introductory “grammar/reader”, but certainly not a “reference” one. Best wishes, and may God be with you!